Battery electric cars emit fewer greenhouse gases and air pollutants over their entire life cycle than petrol and diesel cars, according to a European Environment Agency (EEA) report, published last week. Promoting renewable energy and circular economy, including the shared use of vehicles and product design that supports reuse and recycling, will help maximize the benefits of shifting to electric vehicles. For the purposes of the EEA report, environmental impacts were grouped under the following themes: climate change, health impacts, and ecosystem impacts. 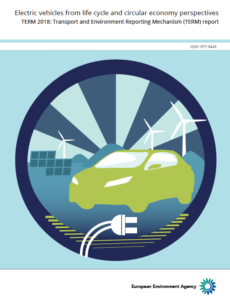 The report confirms that the greenhouse gas emissions of electric vehicles, with the current EU energy mix and over the entire vehicle life cycle, are about 17-30 percent lower than the emissions of petrol and diesel cars. However, as the carbon intensity of the EU energy mix is projected to decrease, the life-cycle emissions of a typical electric vehicle could be cut by at least 73 percent by 2050. For local air quality, electric vehicles also offer clear benefits, mainly due to zero exhaust emissions at street level. However, even electric vehicles emit particulate matter from the tire and break wear, the EEA report reminds. Shifting to electric vehicles could also reduce noise pollution, especially in cities where speeds are generally low and traffic often stands still. It is clear that with the adoption of electric vehicles the transport and energy systems will become increasingly intertwined. The importance of low‑carbon electricity is a theme that has impacts across all lifecycle stages. There will be a need to manage and optimize the increasing electricity needs associated with electric vehicle use and to better understand the impacts that biofuel use in ICEVs could have on Life Cycle Analysis comparisons. Low-carbon electricity will also change the environmental impacts associated with raw material extraction and vehicle and battery production. Although the focus of this study was on Battery-EVs, energy‑related aspects will also be relevant for the production of hydrogen for fuel-Cell-EVs. It will be important for future systems perspectives and assessments to consider the transport and energy sectors more closely.